Attempts to bring superzoom with HDR to users on a budget. Sony 16 megapixel, 1/2.3" CCD sensor. Zoom - Optical: 21x, Digital: Up to 5x (preview), Up to 12x (playback). Lens - Focal Length: f = 4.5 (W) - 94.5 (T) mm; F = 3.1 (W) - 5.8 (T) (f = 25-525 mm, 35 mm equivalent). 3.0" LCD screen with 460k pixels. Movie Mode: HD 720p (1280 x 720), VGA (640 x 480), QVGA (320 x 240) 30 fps, Continuous recording with sound. Shutter Speed - Auto: 1/2000 - 1 sec; Manual Mode: 1/2000 - 15 sec; (Fireworks 2 sec; Night Scene 1/2000 - 15 sec). ISO: Auto, 100, 200, 400, 800, 1600, 3200 (3M or lower), 6400 (3M or lower). Power Source: Approx 330 shots on bundled AA alkaline battery, 500 shots on Ni-MH battery, 850 shots on Li battery. Storage: Built-in approx 108 MB, 4 GB SD \ 32 GB SDHC \ SDXC (>32 GB) card compatible. File Format - Still Image: JPEG (EXIF 2.3), DCF, DPOF; Video: MJPEG; Audio: WAV. Dimensions: 4.4" x 3" x 2.5", 355 g (without battery and SD card). Digital output: USB 2.0 compatible; Audio \ Video Output: (NTSC \ PAL); PictBridge compatible. The GH600 claims to be able to support zoom while recording videos. This feature is avoided by many low-priced cameras because their zoom motors are not really silent, thus introducing a disturbing noise in the recording. The same issue may plague this device as well, because ultra-silent motors are less likely to be available in the lower price range. On the positive side, the ISO 6400 setting could help it shoot better low-light photos, while its in-camera HDR facility will be a joy for photography enthusiasts. 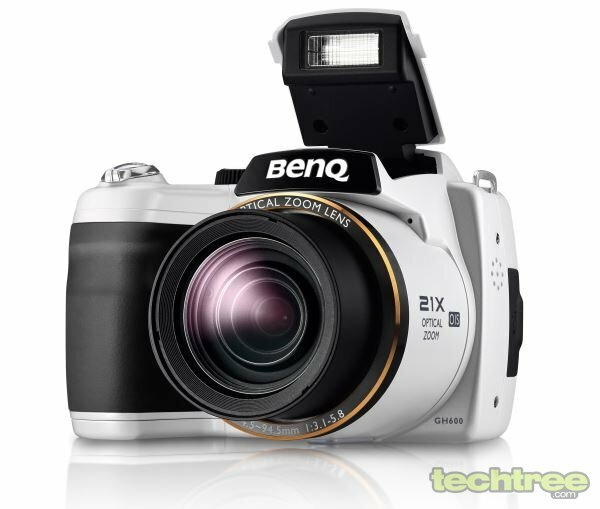 The BenQ GH600 is available in black or white variants and is priced at an MRP of Rs 11,000. Online stores seem to currently show the product as out of stock, but you can buy it from international stores with free shipping to India for slightly less than Rs 14,000. High-quality product images can be viewed in the gallery below.